Welcome to another #MorningWithMeloni! Thank you for joining us every weekday morning at 8am on #1250WHNZ! Today is Wednesday which means it is our favorite day here on #ThatBusinessShow, #WorkingWomenWednesday! 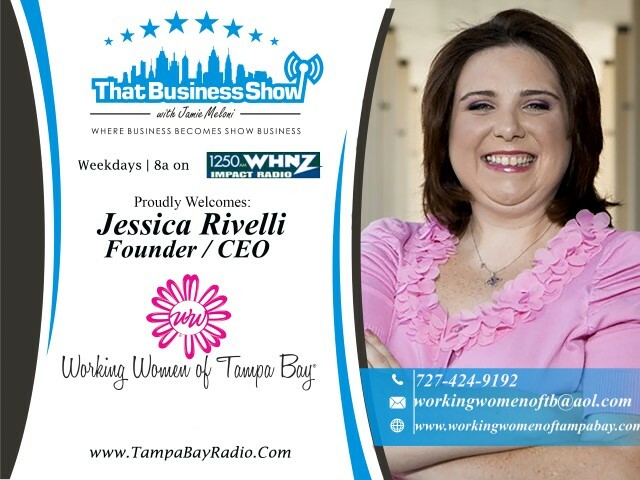 Here on the show every Wednesday we welcome members from the Working Women of Tampa Bay Networking Group led by CEO and Founder Jessica Rivelli who is a huge supporter of our show! We love having her members on the show, as many of them have wonderful stories and talents to share with the community! For example, today we had Carolynn Smith, President of Seven Marketing, Events, And PR! Also accompanying us on the show was Bosnian war and Genocide survivor, Maja Kazazic – who’s story is beyond words. Thank you for joining us today for another #WorkingWomenWednesday, and if you missed the show, head to http://www.tampabayradio.com to catch the interviews! Jamie and Jessica started off the show with a bit of a preview of the guests, telling us of their contributions to the Working Women of Tampa Bay Networking Group and how the group has really benefited them. Jessica Rivelli is the CEO and Founder of the group, an if you missed her on the #MorningAir, then head to http://www.tampabayradio.com today! Coming on after Jessica Rivelli was Carolynn Smith, President of President of Seven Marketing, Events, And PR! Carolynn told us a bit about her impressive resume in journalism and media, and how she got started with Seven. She then began to tell us the whole point of the “Seven”, with her 7 tips for social success – abridged for time of course! Learning those tips from personal experience and from people in her life, she created a model of success for the clients in her group to follow and to succeed with! You can learn all about this model and learn more about Carolynn Smith and Seven Marketing, Events, And PR at http://www.sevenmarketingpr.com! 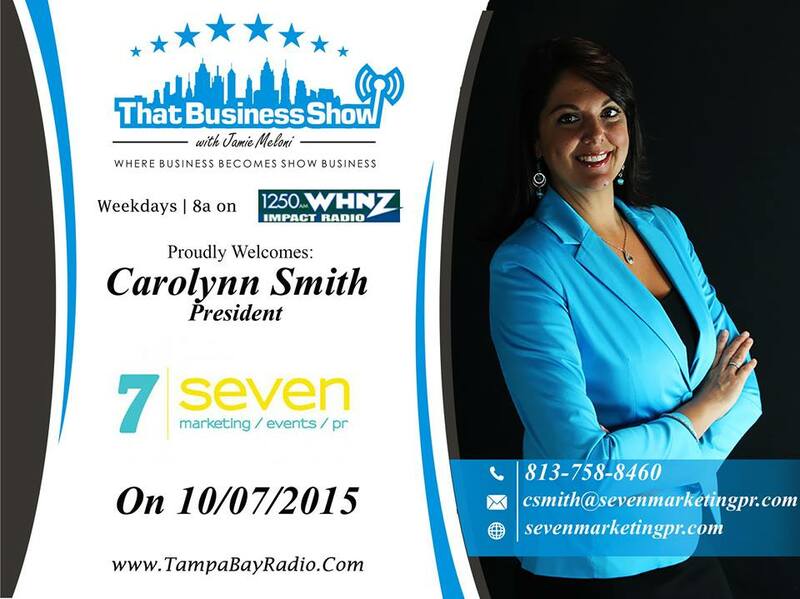 Conatct Carolynn at csmith@sevenmarketingpr.com! This entry was posted in Articles, Entrepreneurship and Business and tagged business, inspiration, radio, word, work. Bookmark the permalink.